Welcome to Harbor Loft. This fun, in-town apartment offers elevated views of Stonington harbor and a location that has you in the heart of Stonington’s quaint village. Enjoy being a quick stroll from the restaurants, shops and galleries in this village setting. Harbor Loft is a two bedroom, one bathroom apartment. Enjoy great natural light and an elevated perspective on the streets of Stonington below. The space is all on one level. There is a kitchen with a gas range and all the basic supplies to pull together most any meal. Harbor Loft has a formal dining area to enjoy those fresh caught lobster dinners we hope you’ll be enjoying while you are here in town. There is a full bathroom with shower and tub combo. The home has a bright and pleasant living space with hardwood flooring and tin ceilings. Harbor Loft has two bedrooms. One queen size bedroom with a small dresser and some night stands. The second bedroom has a full size futon sleeper and an armoire. 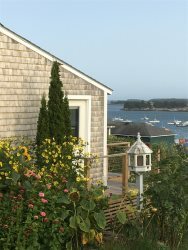 The Harbor Loft does not have private parking since it is in-town, but it is located close to two of the three public parking lots in Stonington. Book your stay at Harbor Loft today. Quick stroll to Isle au Haut Boat Company, near public kayak launch. Pets are not allowed at this rental property.